Although it lacks the aristocratic pedigree of some Paris parks, the Parc des Buttes Chaumont in the 19th arrondissement is my favourite. The Bois de Boulogne and the Bois de Vincennes were formerly royal domains for hunting. But the Buttes Chaumont was once a gypsum quarry, an abattoir for horses, a malodorous dumping ground for night soil, and a hiding place for criminals. A long-gone neighbour was the infamous Gibbet de Montfaucon, where the bodies of criminals who had been hanged would dangle in the breeze, supposedly as a deterrent to other malefactors, but more usefully as a treat for crows and ravens. 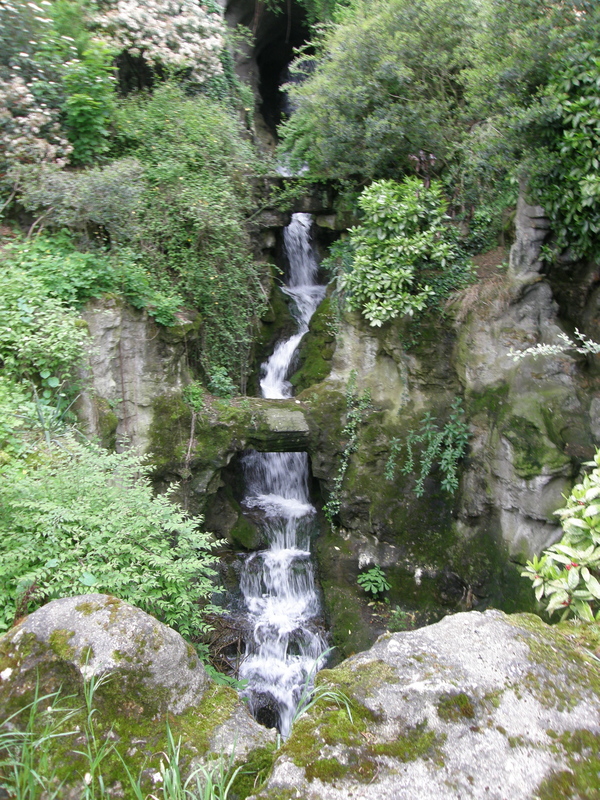 Even today, the park’s rocky waterfall seems far removed from the well-organized Paris created by Baron Georges-Eugène Haussmann. This park was primarily the work of two men: Adolphe Alphand, who oversaw the design and construction of parks under Haussmann, and Jean-Pierre Barillet-Deschamps, chief gardener for Paris. A single-arch bridge overlooks a lake; one could be out in the country. But consider the view below: it is quintessentially Parisian. 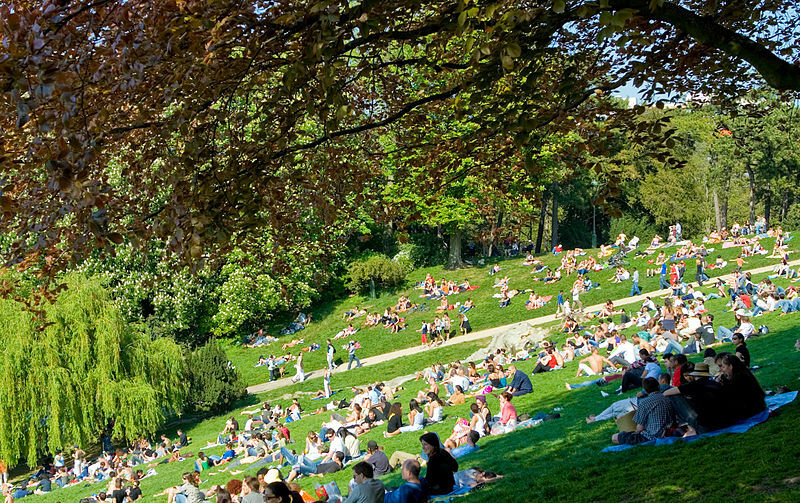 Start with grassy space, add sunshine and soon Parisians will be lounging about enjoying themselves. It is a wonderful sight. In the photo below, taken between 1880 and 1890, we see an island in a lake, covered with trees. At the top is a temple or belvedere, with a long approach path. On the left is the suspension bridge that connects the island to the main body of the park. The background appears to be densely populated. Clearly, the temple is a significant monument placed for maximum visibility. But to get a proper sense of scale, one has to be there, or see images such as the one in the postcard below. 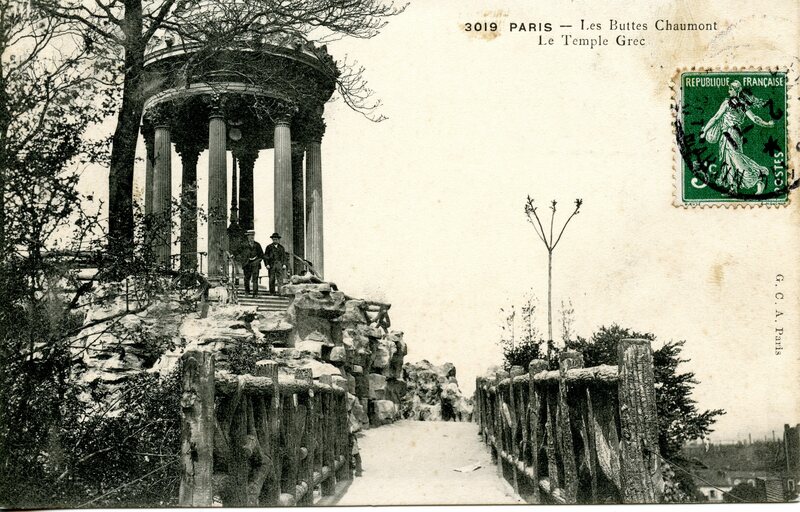 Although it is labelled “Le Temple Grec,” it was actually modelled after the Roman temple of Sybil in Tivoli, Italy. However, the most astounding feature of the park is the huge distance between before and after. 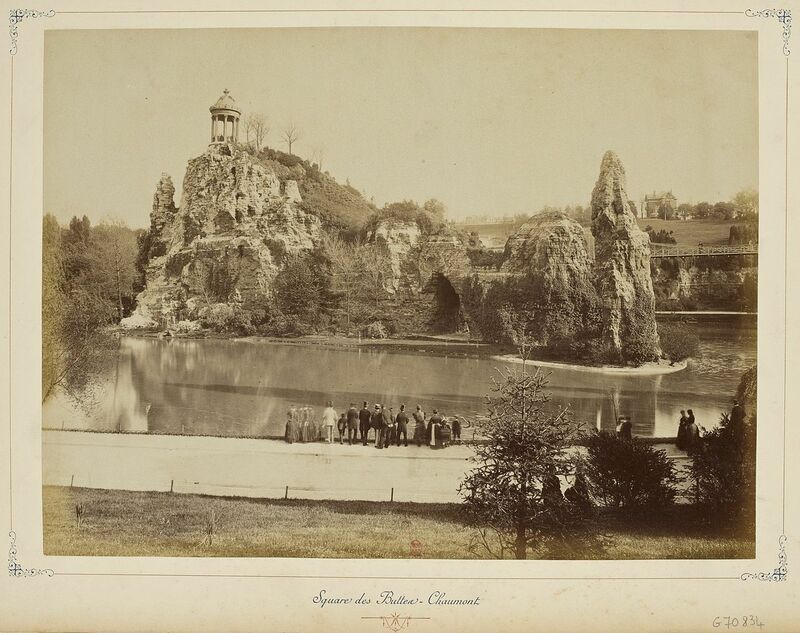 The Parc des Buttes Chaumont opened as a free public park on April 1, 1867, as part of the opening of the Paris Universal Exposition on the same day. The city was in the midst of the upheaval often called “Haussmannization” that transformed Paris from a mediaeval city of narrow, often filthy and smelly winding streets into the Paris of wide boulevards, long vistas, sculptures and monuments, imposing public and private buildings, a reliable water supply, sewer systems and clean streets. While much has been written of the geometry of boulevards, vistas and buildings, Napoleon III also wanted parks, like those he had seen in London during his sojourn in England. Under his orders, the Bois de Boulogne was completely redesigned to fit the English model, with winding paths and varied terrain. But not all of Paris had former royal hunting grounds that could be converted so easily. Through annexation, Napoleon III nearly doubled the size of Paris and during his reign the population of Paris also nearly doubled. Some of the newly annexed areas, particularly those in the north and northeast were sparsely populated and largely poverty-stricken. But they, too, needed parks. Parks were seen as healthy antidotes to poor living conditions as well as an aid to keeping political turbulence and restlessness in check. Part of the annexed area included the quarries of the Buttes Chaumont. So much of the gypsum quarried in this area had been sent to the United States that the site became known as the American Quarries. Parks were supposed to be beautiful, restful, green, healthy. This was a scar on the landscape. 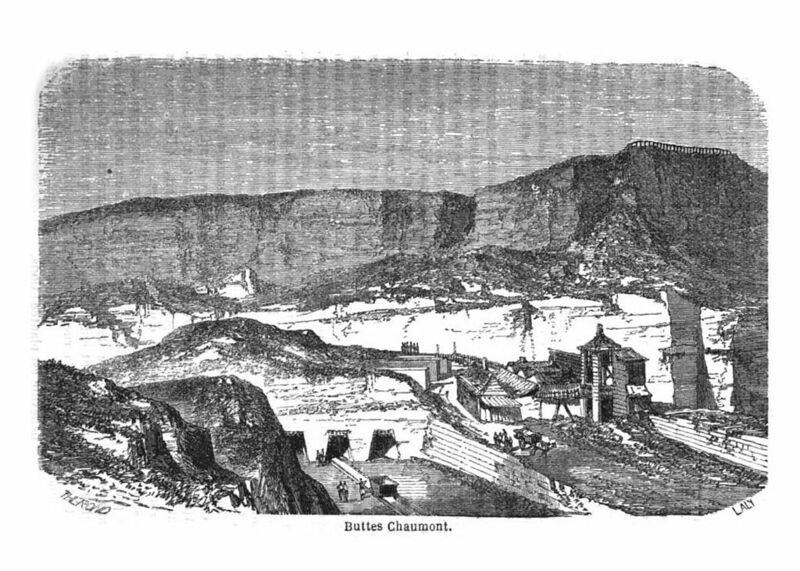 The photo below of a part of the quarry was taken in 1877. 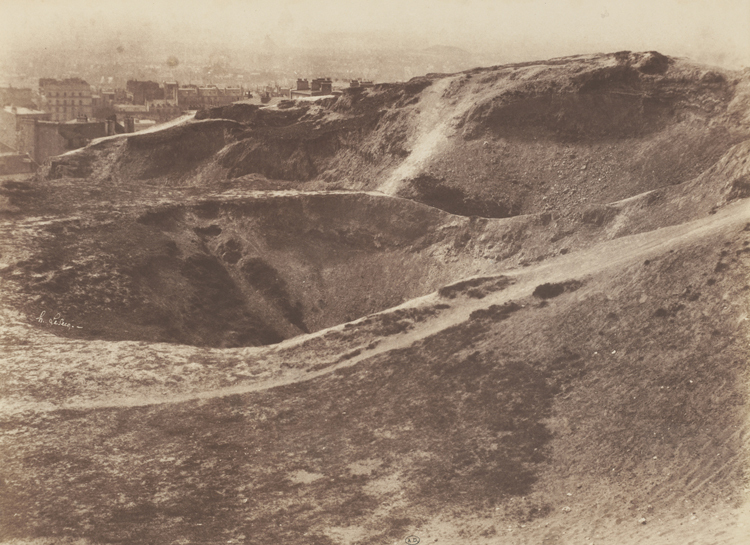 Here, in an 1852 photo by Henri le Secq, we see the desolate, almost lunar landscape, but also how closely it encroaches on inhabited areas. Perhaps an even better idea of the unlikely site comes from this image from an 1863 guidebook. Unlikely as the site was, it became the focus of Haussmann’s plans for a new park. Things happened quickly. In late 1863 the city of Paris acquired the site between La Villette and Belleville. Construction started the following year. Some of the statistics are staggering. 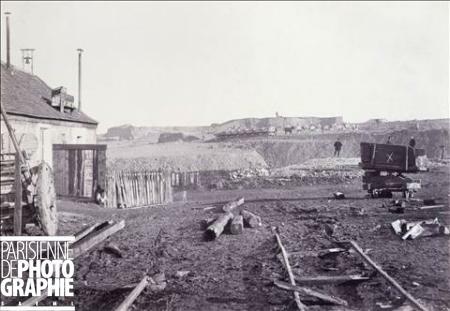 There were about 1,000 workers, 100 horses, 450 wagons on 39 km of temporary rails, huge amounts of dynamite. Workers excavated 800,000 cubic metres of material and brought in 200,000 cubic metres of soil ready for planting. Part of the site included a suspension bridge by a young engineer by the name of Gustave Eiffel. The bridge remains, but is less well-known and visited far less than the tower he co-designed and built for the 1889 exposition. In this photo, taken during construction, we begin to see the key features emerging. The famous brick bridge is visible on the left and we see the large land mass above what is to be the lake. In an 1867 guide to Paris, an engraving of the completed park shows the suspension bridge in the middle distance, the brick arch bridge on the far right, and, on top of the promontory, the temple. Having the park ready for opening day April 1, 1867, was a staggering achievement. However, the park was not a financial success. Like many of Haussmann’s projects, it ran over budget. Moreover, it did not have the economic effect that had followed the creation of the Bois de Boulogne. That park had raised real estate values in the surrounding area, which in turn increased taxes flowing into the city coffers. Money had also come from the sale of state property whose value increased as a result of the Bois de Boulogne. This scheme of raising real estate values near parks worked in the more well-to-do western areas, but it did not work in the northeast of Paris. 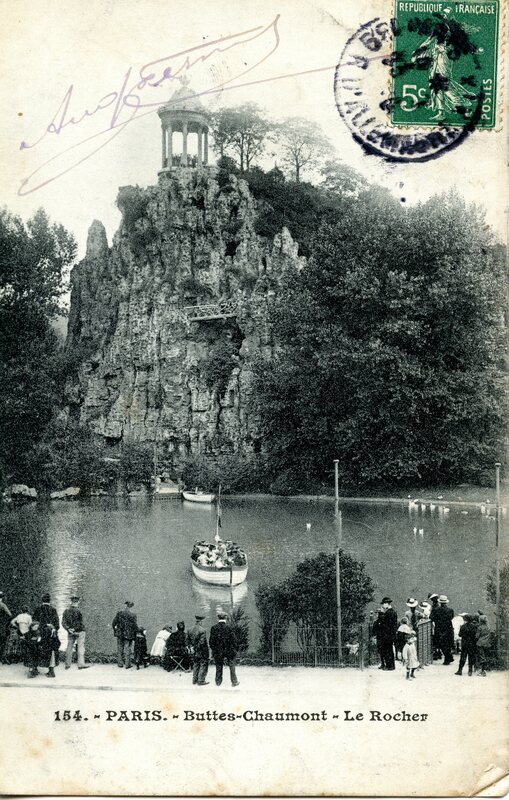 Of all the late 19th and early 20th century photos of the park, the one below is perhaps my favourite. Somehow the massive landscape and the people seem to fit as they should. But what else is the photo saying? When I look at the people in this photograph, I see that they are dressed formally, but are probably not wealthy. The women’s gowns are quite plain. They might be visiting on a special occasion, but they may not be far from their homes. Perhaps they are proud of their park. When I think of who might be in this photo, who might have come to the park, I think of something that touched me deeply when I first read it. A worthy man of about forty, with a tired face and greying beard, stood holding a small boy by the hand and carrying on his arm a tiny child, still too weak to walk. He had assumed the role of nurse-maid, taking the children for an evening stroll. All were in rags. Each looked at the scene differently. The photo above was taken about 40 years after Baudelaire wrote those lines. One hopes that the people who knew that the bright cafés of the new Paris were not for people “like us” could go to the Parc des Buttes Chaumont because it was for people like them. Did the poor boy once dressed in rags come there as a man? I appreciated the Parc des Buttes Chaumont before I knew its story, its history, and its possible meanings. It reminds me of another park I knew as a child growing up in Hamilton. When visitors came, we would take them to see the Rock Garden in the Royal Botanical Gardens on the far side of the city. It was a magical place for a little boy. Later I learned it had been built in a disused gravel quarry as a make-work project for the unemployed during the Depression of the 1930s. 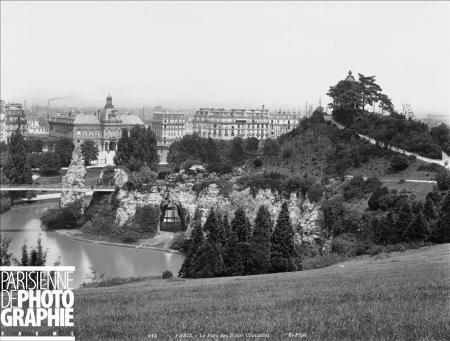 Like the Buttes Chaumont, it was a place where you could feel you belonged, no matter what part of the city you lived in. Text and original photographs by Norman Ball. Postcards from the collection of Norman Ball. Additional images from Paris en Images, Wikimedia Commons, and Gallica. This entry was posted in Paris parks and tagged Adolphe Alphand, Bois de Boulogne, Bois de Vincennes, Charles Baudelaire, Eyes of the Poor, Georges-Eugène Haussmann, Gibbet de Montfaucon, Gustave Eiffel, Henri le Secq, Jean-Pierre Barillet-Deschamps, Napoleon III, Parc des Buttes Chaumont, Paris Spleen, Royal Botanical Gardens. Bookmark the permalink. Oh Norman, this is a lovely blog! Quite touching. Thank you. On my last two visits to Paris I have spent periods wandering in the Buttes Chaumont. Your information helps explain why I experienced it as a more personal parc than Luxembourg, the Boise de Boulogne. 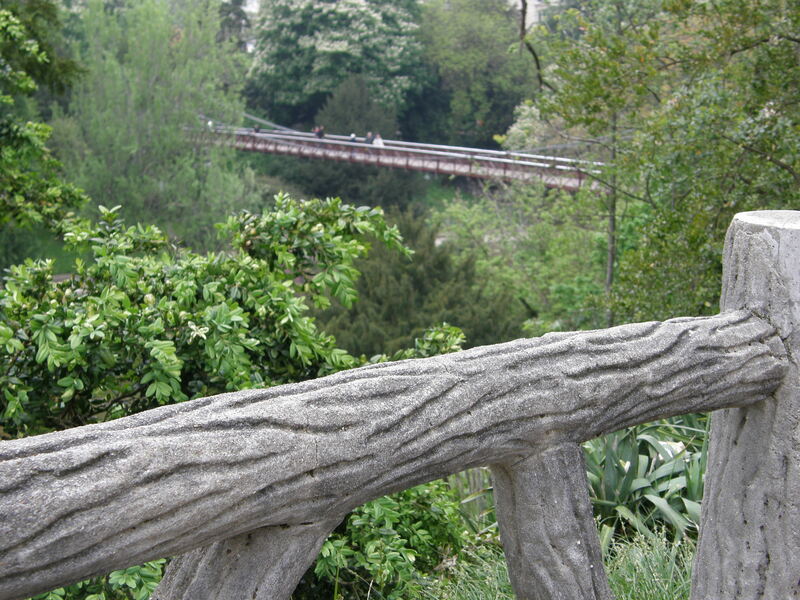 There was also a sense of ‘ discovery ‘ and connectedness as I wandered, climbed and sat in this beautiful parc. I was fortunate to meet a native Parisian, a woman of my age, who toured me through this park on my last sojourn in Paris. We even stopped at a café in the parc for an apéro. Your article was very enjoyable.